Mark Millar is an awesome writer. He is also a nutcase. Cut from the same cloth as the Morrisons, Milligans, and other nutso comic book writers of this world, Millar, when he’s on his game, is probably my favorite of them all. He’s already proven he can write for Marvel and DC, and Superman in particular. His landmark Elseworlds tale Red Son is heralded as being one of the greatest Superman stories ever, and for good reason. Millar shows he can juggle crazy Silver Age concepts with character stories and plenty of fantastic action. Most important of all, he has a firm grasp of who the Man of Steel is, not to mention Clark Kent, which as we all know can be difficult. With this in mind, I recently bought a copy of “Superman by Mark Millar,” a paperback collection that is a smattering of Superman stories he’s written that are not named Red Son. 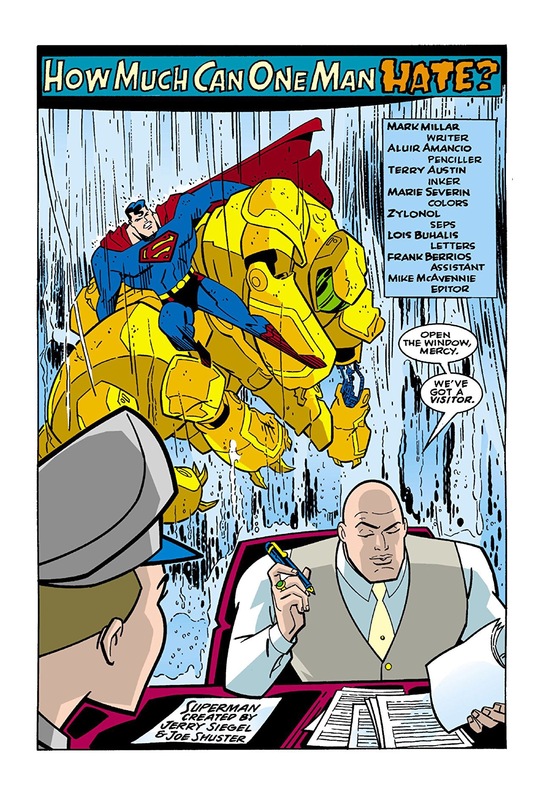 Included in this volume are random short stories from Superman specials, as well as eight issues of his celebrated run on Superman Adventures. All but one are standalone adventures, which is probably why they were selected for this volume as opposed to other Superman stories under his belt. The trade clocks in at 280 pages, with nice cover art and intro pages, all printed on beautiful glossy stock, my preferred choice of paper for trade paperbacks. I know some complain about the glare and prefer a more course material for TPBs, and I can appreciate that. My feeling is if you’re going to buy a collected volume of something, it should be nicer than when it was initially printed and feel like a real upgrade. Just my two cents, anyway. As for the stories themselves, I’m very impressed with how good a Superman writer Millar is. One wonders why DC didn’t put him on one of the ongoings from the minute he started working for the company. Each story has a wonderful premise with a plausible threat for the character that doesn’t diminish his power levels, something that is very hard to do. Clark Kent and the rest of the supporting cast get just as much spotlight as Superman himself as well, which I have always felt makes a Superman book stronger. All the stories in this book are solid, but the highlight of this book for me, hands down, was the opening short story told from the perspective of Lois Lane from Superman: 80-Page Giant #2 (1999). Drawn by Sean Philips, a treat in and of itself as he is not often associated with bright books, the story is a character piece about Lois and her feelings about her super husband juxtaposed with Lex Luthor’s feelings about him. It’s a wonderful story which is narrated entirely from her point of view without feeling tedious or clichéd. Great stuff. The weakness of this book for me is not that anything is particularly bad. Actually, far from it. It’s simply that, of the aforementioned 280 pages, over 200 of them are taken from Superman Adventures. Despite being a huge fan of the Timmverse cartoons of the ‘90s and early 2000s, I never got into the corresponding books which adapted the shows (an adaptation of the adaptation?). Superman Adventures was clearly intended for a younger audience, and as such the plotlines aren’t very deep and usually revolve around a new scientific gimmick Superman has to protect, or some new villainous plot by Lex Luthor to kill Superman, without getting too much into anything else. On top of that, because the stories are adapted from the look of the ‘90s cartoon, no matter who pencils or inks each story, the artist is pigeonholed into drawing it one particular way. Everything looks exactly the same because it must resemble the art of Bruce Timm, and as a result you don’t get the variety that you would from an ongoing book or graphic novel, which unfortunately takes away a lot of the fun. Don’t get me wrong, the Superman Adventures issues are fun, and probably right up the alley of other Superman fans, so it doesn’t stop me from recommending this book as your mileage may vary. Still, the other stories collected in this volume actually made me very interested to not only read more of Millar’s Superman work, but more of his DCU stuff, in general. One hopes that as DC endeavors to collect more Superman stories of the post-Crisis era, we get to read the other issues Millar wrote within the framework of the monthly books. After reading this collection I can safely say that Millar has a grasp on the Man of Steel that few others do, and the fact that he has written the character in so many different continuities only makes it that much more impressive. My hope is we see more creator-themed TPB lines, and more Millar Superman reprinted in the near future. All in all, good stuff, just wasn’t completely my cup of tea.